Guide for the English Fate Grand Order Master Missions - January 15 ~ January 22. FGO Na's Master Missions - January 15 ~ January 22 comprise of farming enemies and pieces or monuments from the training grounds. Here's a guide how to quickly finish them. Welcome to our Fate Grand Order Master Missions Guide! Master Missions – January 15 ~ January 22 are part of the Fate Grand Order weekly quest system that you can perform while doing other battles. They refresh every week, and they award Saint Quart Fragments. Players then can exchange them for valuable Saint Quartz. For Master Missions – January 15 ~ January 22, majority of the Fate Grand Order master missions may require certain gems to be hunted down. However, for those not in a hurry and to have an easier time, players can farm the Training Grounds. Depending on what level they are, the gems will drop for the class they decided to farm for. However for those who want to do the mission easily, they can always exploit the lowest quest AP for this mission. But, this also depends on the kinds of ascension materials the players need. 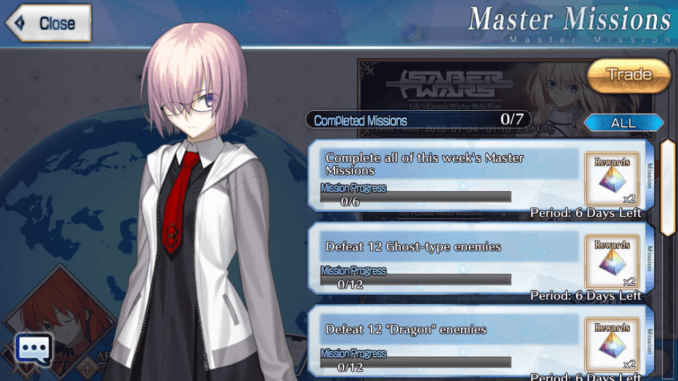 Some of the Fate Grand Order English Master Missions dictated for Master Missions – January 15 ~ January 22 can be quite annoying as they are time-gated. 2 Defeat “12” Dragon Type Enemies. 3 Defeat “3” Evil Servants. 4 Acquire 3 Pieces or Monuments of Lancers, Riders, or Sabers through battles. 5 Acquire 3 Pieces or Monuments of Archers, Casters, or Berserkers through battles. 6 Acquire 8 Pieces of Monuments through battles. Unfortunately, the Saber Wars Event won’t be able to help you too much through missions 4-6. However, Saber Wars Event can help you with the first three missions in which players must fight 3 Evil Servants, 12 Dragon Type Enemies, and 12 Ghost Type Enemies. Ghost Trait currently only encompasses Ghosts and does not include Skeletons. For a better reference for Evil servants, check out the Evil Servants Guide. The Master Missions – January 15 ~ January 22 focus heavily on farming though, the last three missions need time away from the event. Since the Saber Wars Event ends on January 18, 2018, players can wait until the event ends in order to gain the last three missions. Or, to make it easier, players can also go for the easiest of the training grounds quests to grab the pieces. That way, players can still spend time going through the Saber Wars Event.